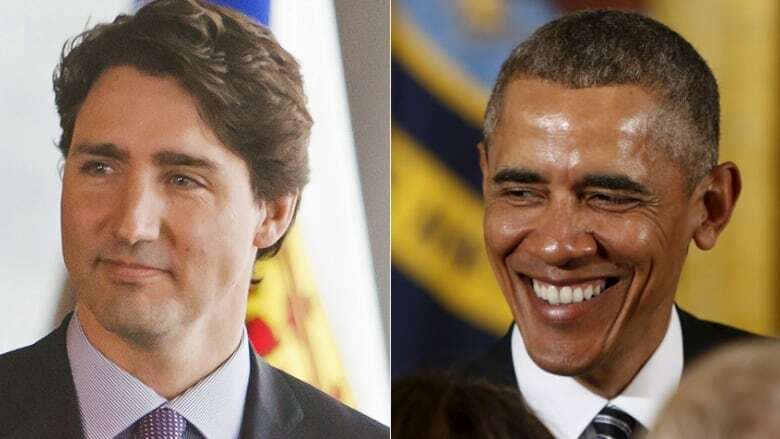 Prime Minister Justin Trudeau and President Barack Obama will announce an expansion of customs pre-clearance locations in Canada during their official meeting Thursday, CBC News has learned. U.S.-bound passengers travelling through the Billy Bishop Toronto City Airport and Quebec City's Jean Lesage Airport and those travelling from Montreal's central train station will soon be able to clear customs in Canada. The move is the latest effort to make travel between the two countries more convenient for travellers, at the same time the U.S. is looking to obtain much more information on passengers moving across the lengthy Canada-U.S. border. There is also expected to be an announcement on the extension of the program for the inspection of cargo arriving at major ports in the two countries, although the details were not yet finalized late Thursday. Eight Canadian airports and Vancouver's Pacific Central train station already have U.S. Customs and Border Protection pre-clearance facilities that allow passengers to skip traditional border stops when entering the U.S. Under the program, air passengers can also fly into American airports that are not equipped with customs officers, most notably Washington's Reagan National Airport. Obama's national security adviser, Susan Rice, told CBC News Wednesday that the U.S. is looking for much more information sharing from Canadian officials to better protect our countries against terrorism. "I think from the American perspective, frankly, our concern is not that there is too much, but that at times there's been too little," she said in an interview with Peter Mansbridge. "We must do [this] to ensure that what has transpired on 9/11, what transpired in Ottawa, or in San Bernardino, is not a day-to-day occurrence in our countries. "From the U.S. point of view, yes. More [information sharing] is better. We have to do it carefully, we have to do it with very clear understandings and protocols. But we're not serving our people on either side of the border well by hiding or protecting stuff to the point that we're leaving each other vulnerable." Rice was asked about reports that Canada used the U.S. biometrics system to check each of the 25,000 refugees that came to Canada and if that was normal procedure. "I don't know if it's normal for countries to utilize our biometrics process, but given that our systems are so linked and we have the ability to share, we think that's mutually beneficial," she said. "Our ability to share information and to exchange biometrics information is vital to both sides," she added. Rice said she believed that if red flags popped up in a collaborative vetting process, it would be up to Canada how to respond to information the U.S. provided. "What we would do is share with our Canadian colleagues the info that we have uncovered and allow them to make judgments based on that," said Rice. Michel Coulombe, director of the Canadian Security Intelligence Service, spoke to a Senate committee Monday, giving details regarding how refugees were screened by the agency. Coulombe said that normally when a red flag pops up during refugee screening, CSIS launches an investigation, digging deeper into the person seeking entry, but in the case of the Syrian refugees, those cases that caused concern were simply rejected. "If a red flag came up, because of the tempo, we had no time to do this," he said. "That file was taken and was put aside. The moment there was a concern, that file was put aside and was no longer part of that 25,000." In December 2011, then prime minister Stephen Harper and Obama signed the Beyond the Border plan, which would establish a co-ordinated entry and exit information system. Canadian officials said as recently as last fall that the entry-exit program is in its final stages, though no revised dates have been unveiled. The roll-out of the program — initially scheduled for June 2014 — has stalled after the then privacy commissioner, Jennifer Stoddart, raised concerns about the misuse and inaccuracy of data collected at the border. Some critics have raised the example of Maher Arar, a Syrian-born Canadian who was deported in 2002 by American officials based on misleading information supplied by the RCMP. He was later tortured in Syria. "Yes, there's been individual incidents that have been problematic or regrettable," Rice said when asked about the Arar case. "But in general as two democracies committed to the protection of rights and liberties … we think that we have to get the point where we can find the ways and means of sharing information while protecting it." Alan Bersin, assistant secretary for international affairs at the U.S. Department of Homeland Security, said there will be developments to announce on the entry-exit program during Trudeau's official visit. "The prime minister's visit this week is a crucial step in the transition, this notion that Beyond the Border is the way we do business together," Bersin said in an interview with Chris Hall on CBC Radio's The House. "The prime minister and the president will be announcing a series of steps that confirm the direction in which we've been moving." The proposed tracking system involves exchanging entry information collected from people at the land border — so that data on entry to one country would serve as a record of exit from the other. In addition, Canada plans to collect information on people exiting by air — something the United States already does — by requiring airlines to submit passenger manifest data for outbound international flights. The two countries plan to use the data to detect people overstaying their visas and to determine whether those subject to removal or departure orders have actually left. It will also help gauge whether someone has met residency requirements for citizenship by measuring how long they have been present in the country. And it could help prevent people from assuming one identity in Canada and another in the U.S. The U.S. has the legislative authority to proceed, but the Trudeau government would need to pass a bill to authorize this form of information sharing.